Large 5 feet high by 10 feet wide hand-painted murals with Western Theme to highlight the school's pioneer heritage. Memorabilia boxes on the walls with items supplied by student groups. 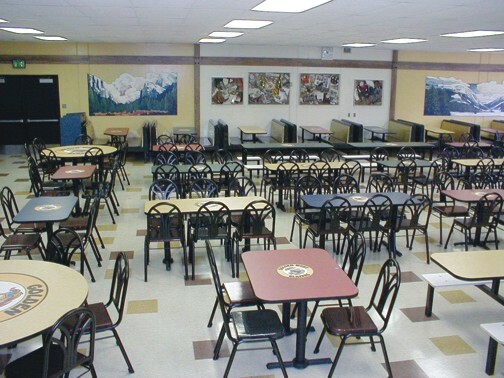 Before: I'll bet you would have a hard time finding an uglier cafeteria than this! I mean, how 1960’s can you get? 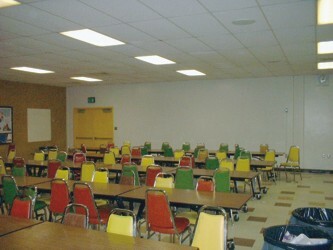 After: We designed large 5 feet high by 10 feet wide art panels on the walls with beautiful mountains to highlight the school’s pioneer roots. Then we added colorful furniture and more western themed artwork. The walls have wood planks to give a wild west rustic look.